Home » Skywalker--Close Encounters on the Appalachian Trail » Appalachian Trail and Pacific Crest Trail Are For the Average Person. Honestly! Appalachian Trail and Pacific Crest Trail Are For the Average Person. Honestly! “Why do you want to try to do that?” friends asked in a mixture of curiousity and concern. This was the type conversation I repeatedly had in the runup to my Appalachian Trail thru-hike in 2005. The idea of doing a thru-hike of this 2,180 mile wilderness trail haunted and beckoned. What ultimately ensued was a seesaw battle between my incompetence on the one hand and determination on the other. To say I was an average person attempting something of above-average difficulty was something of an understatement. I was 44 years old and never had even spent a single night outdoors. Nonetheless, I set off from Springer Mountain in north Georgia, full of hope and trepidation. It proved to be the journey of a lifetime, that could only be matched by the 2,663 mile Pacific Crest Trail, which I did four years later. I lost 33 and 43 pounds, respectively, on the these thru-hikes. How often can a middle-aged person do something in which they get to use all of their abilities? Perhaps this is one reason these long-distance hiking trails endure in so much popularity. The assortment of characters of different ages, backgrounds, personalities, and abilities was truly astounding. And all the reason more that I would recommend the Appalachian Trail and Pacific Crest Trails for just about anyone with the desire to shed the trappings of civilization and head off into the ‘Great American Outdoors’. 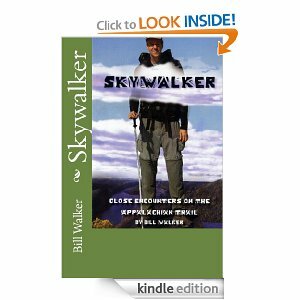 Bill Walker is the author of Skywalker–Close Encounters on the Appalachian Trail, and Skywalker–Highs and Lows on the Pacific Crest Trail. He is also the author of The Best Way–El Camino de Santiago and Getting High–The Annapurna Circuit in Nepal.